I took a walk, (okay, a limp) around my house today looking for new ways to photograph familiar subjects. 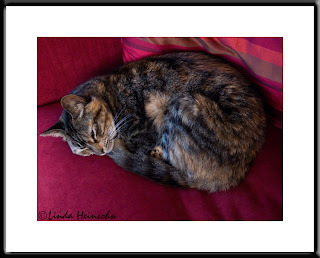 Here's Malibu framed nicely sleeping in the red chair. She's a scardy cat and resists photo ops like this; she zoomed away soon as she heard the focus mechanism on the camera working. But I caught her at least in one cozy pose for my blog.